A few photos before I packed this jersey dress off to Clara. 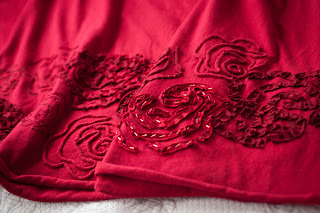 I used the "Kristina's Rose" stencil available from Alabama Chanin's downloads, and stenciled the design in dark red (plain old red I mixed with a little brown). Both the front and back of the dress have a border of about ten inches of roses. and below here is the wonderful couching technique, where you stitch down strips of jersey that have been pulled into ropes. I love this one and it goes really fast--and the ropes are remarkable easy to shape precisely. I worked in two colors of jersey--the red of the dress, and a darker red from a tee shirt from Goodwill. 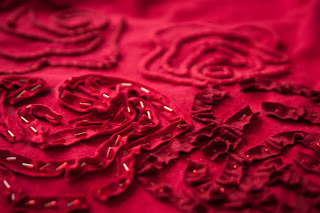 I did a bunch of roses from appliqued strips, sometimes laid flat with bugle beads on top, and sometimes done in random ruffles, with gathers stitched into the strip. This one's fun too. 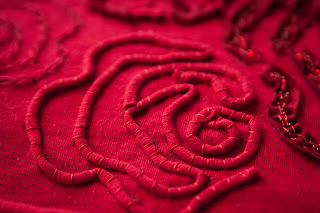 And last, I finished the neckline in a beaded rosebud stitch. I can't wait to see it on Clara when she comes home for summer! Wowee - I also hope to see it in its entirety when she comes home. That's a beauty. What a beatiful color! I bet it will look georgous on Clara. This dress is gorgeous. I hope we can see a picture of her wearing it. Your work is so beautiful, Anna! More and more I am becoming interested in trying this type of project myself. I would like to ask about caring for the finished garment. How do the embellishments respond to washing and drying. Can you share your experiences? Thank you! Absolutely GORGEOUS!!!! And that color will look stunning on fair Clara! Gorgeous! It makes me think of roses: American Beauty Red Roses, to be specific. We all would like to see photos of the dress on her, I'm sure. I made this from Alabama Chanin's organic cotton jersey. 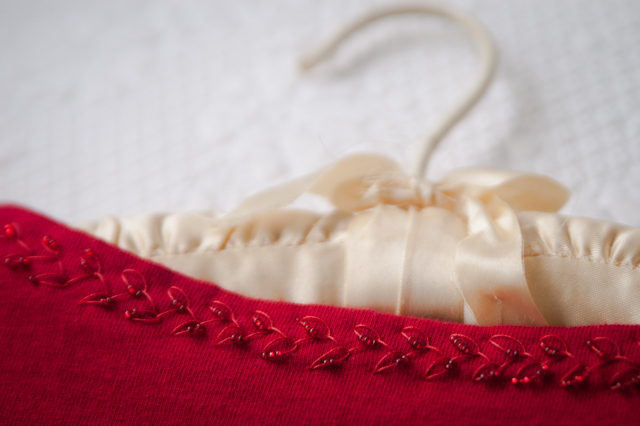 I think buying a ready-made jersey dress to embellish would be a great start--but I'd made sure to use a quality garment that wasn't going to fall apart on me. For sewing jersey I use my regular sewing machine with the stitch set to a shallow zigzag--but I do like doing the garment construction by hand, and this red dress is all hand-done. Honestly, once I know the pattern is fitted correctly, it's not even two hours of sewing to put it together *by hand*, and that's with pleats in both sides of the bodice. Elaine, machine wash on gentle, lay flat to dry! 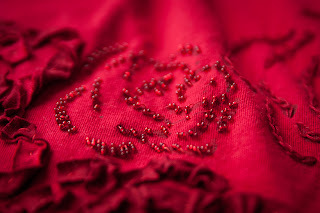 Beaded garments I turn inside out. Everything's holding up just fine. Thank you for your reply! I have some cotton knit to make a top; I'm getting courage now to try embellishments! Two Hours? To construct the entire dress?? You are crazy fast! I was poking around Garnet Hill's site earlier, and noticed the knit dress with the roses on the bottom. Of course, I've looked at this dress several times before, but never "got it" that they're most likely imitating Natalie Chanin. From what I can see of your rose dress, it's prettier.